Vital for business, commerce, industry.Essential for economic growth. Good, reliable communications are fundamental in bringing prosperity to impoverished and developing nations and for keeping pace with changing demands on trade and finance. This is what organizations such as the WTO, the ITU and the EU have been espousing and which is also part of the spirit of NEDAP. But when it comes to establishing the guidelines, implementing the rules and creating the economic feasibility to open up previously closed telecommunication markets in Africa, someone forgot to tell the Regulator. As recently as last December, Regulators from Africa and around the globe, met in Geneva to discuss “bridging the digital divide”. Jointly, they prepared a blueprint of what should be done to ensure that global access to the tools of communication is extended to all of humanity. Unfortunately, many Governments – and particularly some in Africa – only pay lip service to these ideals, preferring instead to use deregulation and license fees as a way to improve their consolidated revenue, with little thought given to improving the telecommunications infrastructure. A number – nameless – use fees to improve politician’s lifestyles. Within the African market we see a huge disparity – and very little commonality – towards the pricing and issuance of licenses. And the introduction of Voice over IP (VoIP) seems to have not only caught many unawares, but without the structure in place to deal with it sensibly. Call centres in Africa are flourishing! They bring much needed employment and enhancement of skills to countries with cheap labour. The question that remains is how are these call centres to be connected to the outside world? In most cases, this is an afterthought; a throw-away line in an unfunny comedy sketch. Some countries, notably Nigeria and to a lesser extent, Ghana, (and possibly others) forged a de-regulation policy some years ago that has seen mobile connections and other telecommunication services flourish. One has only to see the success of the mobile industry in Nigeria to see the advantages to letting private enterprise participate in telecom sector development. According to the CEO of the Nigerian Communications Commission, Mr. Ernest Ndukwe, the growth in telephone lines had exceeded 500% within two years of opening the market to competition. Malawi is another good example of a Regulator that understands the link between ICT and the fostering of development. The Malawi Regulatory Authority, which was recognized last year by the VSAT Forum for its efforts, views itself as a facilitator, not just a collector of fees. Now it is possible to get a VSAT license in under a month, with a minimum of fuss. Others seem to still believe in a monopolistic, almost protective approach and have severely curtailed the growth of the telecom sector. When GS Telecom started business in the early ‘90’s, it was effectively impossible or uneconomic to get a satellite operator license in more than a clutch of African countries. Today, there are effectively few in which satellite operator licenses are not available. Surprisingly, one of these is South Africa, who stands out as continuing to restrict new entrants and is yet to deregulate past a very creative – and some would say, unworkable partnership – for the Second National Operator. That is not to say that it is either easy or cost-effective to obtain a license in the continent’s other nations. Ethiopia entirely bars VSAT services. VSAT licensing in Kenya briefly opened in 2002, but has been frozen since January 2003 with no change in sight, while it “re-examines its licensing regime”. In other countries it is simply economically unfeasible to bother. Zimbabwe has imposed a US$72,000 per annum fee, many times the cost of a decent earth station. To what end, one might ask? At the meeting in Geneva, this Global Symposium for Regulators agreed to “best practice regulatory guidelines for achieving universal access”. They should have perhaps added some standardization on pricing and licensing policy. A sound working knowledge of these issues is essential when doing business in Africa. Selecting a telecoms partner with in-depth experience of the African licensing and regulatory situation is critical. Founded in the United Kingdom in 1994, GS Telecom has now been providing Africa with dependable satellite communications for a decade. Our experience and service to multinationals, corporations, businesses and Governments on the African continent is second to none. GS Telecom is the leading satellite systems provider in Africa and the company supplies fully engineered solutions to telecommunications network operators in both the public and private sector. We are a one-stop-shop organization and provide all of the facilities that a customer requires, including data, voice and Internet connectivity, space segment procurement, maintenance and network design and operations. The company also employs both its own legal counsel to address the thorny issues of licensing and has remarkable success, with licenses for our customers being granted in more than 25 African countries. GS Telecom started business in Nigeria when it played a key role in bringing together NITEL – the Nigerian parastatal – and five international oil companies – Shell, Mobil, Elf, Chevron and Agip – to develop a US$10 million private TDMA satellite network. This network, known as BIZNET, was an NSI Communications TDMA satellite system. GS Telecom operated this network for more than eight years with availability over 99.5%. Today, GS Telecom is a network operator with international telecommunications licenses in Côte d’Ivoire, Ghana, Nigeria and Mozambique. We have installed nearly 400 Very Small Aperture Terminals for more than 100 blue-chip and corporate customers in over 30 countries across Africa. The company is currently providing service in more than fifteen countries, including Senegal, Sierra Leone, Zambia, Guinea, Mali, Côte d'Ivoire, Ghana, Nigeria, Cameroon, Gabon, Congo (DRC), Tanzania, Malawi, Zimbabwe, Mozambique and Angola. 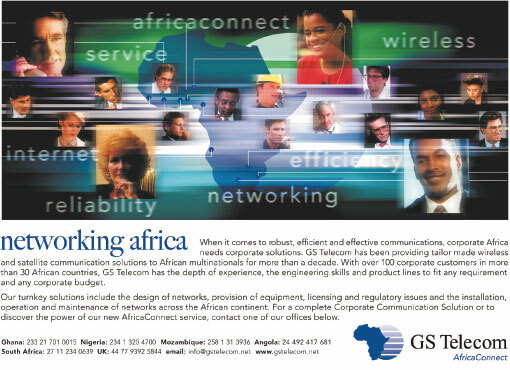 GS Telecom has grown to be arguably the largest privately held communications company in Africa. Understanding our market is our strength. To meet demand, GS Telecom has expanded its maintenance and operations sites across the continent as its customer base has grown. We realize it is essential to provide first-class maintenance services for our customers and our preferred method of providing this is with our own engineers rather than through sub-contractors. We have well trained IT staff that help with customer interfaces or work with them to solve their router, IP network and other network problems. 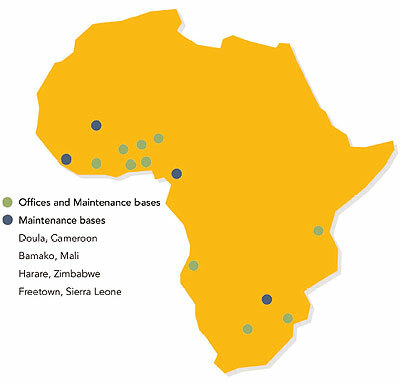 GS Telecom and its subsidiaries have a total of over 230 employees and have offices and maintenance bases in 10 countries in Africa and in the UK.